Our family always knew that my grandfather’s dad died in Baltimore when my grandfather was ten, and his mom when he was eighteen. For some reason, I never asked him how they died. 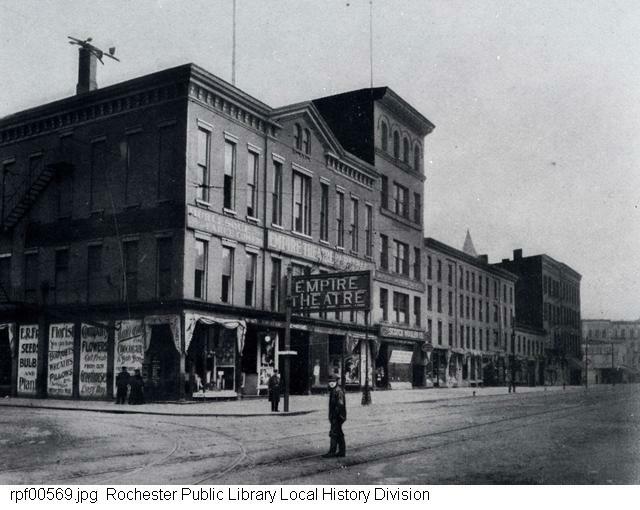 Of course that all changed once I began exploring Great-Grandfather George’s life. After my aunt died, her office sent me her personal effects, which included one small folder of genealogy papers. One of those papers was a request for Great-Grandfather George’s death certificate, but she was unsure of his death date – not even the year – so she never received a reply. I later found out that my grandfather and his mom were back in Lynn, MA in 1933. Since my grandfather was born November 1921, he was ten primarily during 1932. The death year had to be 1932! 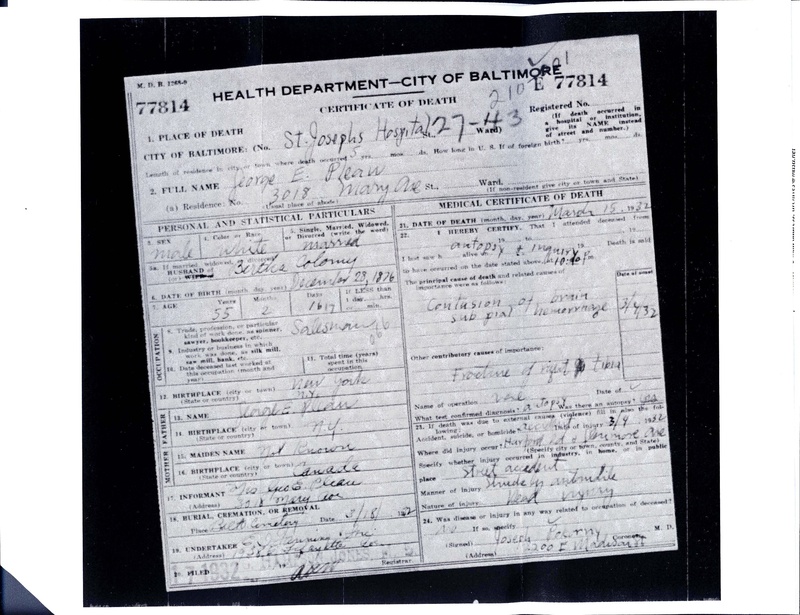 So I started to look on-line at Baltimore’s 1932 death indexes. (Word of warning to anyone looking through these indexes: they are NOT in alphabetical order!) I had to look through each page until I hit on George Pleau. There it was: March 15 (yes, the Ides of March)! And out went the order for the death certificate. During the evening of Friday, March 4, George was walking on Harford Road, at the corner of Glenmore Avenue, just three blocks from home. I assume he was on his way home from work. He stepped out into the street, perhaps to cross, when he was struck by a southbound car, driven by Vincent Leva. I’m certain that it wasn’t long before Bertha and George, Jr. became aware of the accident, although I don’t know how they were informed. George was brought to St. Joseph’s Hospital, having suffered a severe head injury and a broken leg. Whether or not he was conscious at all after the accident, he did cling to life for another week and a half, finally passing at 10pm on March 15. What a burden Bertha had to bear in those uncertain days! She did spend some time in the hospital, having given the necessary information for George’s death certificate. Besides her own grief, she would have to comfort her young son. If she was still working as a music teacher as she was in 1930, she would have had to deal with cancelling lessons and trying to decide whether to reschedule. I do know from my grandfather’s brief account that Bertha also reached out to George’s family to inform them of his death. However, neither they nor her own family could be of immediate help to her, since they all lived so far away. Three days later, the funeral was held at the E.I. Fanning & Son Funeral Home at 9:30am, followed by a 10am service at the Episcopal Church of the Messiah, which still exists at 5801 Harford Road. The hospital and funeral costs had to have financially devastated Bertha, as George was buried at Baltimore Cemetery without a headstone. Vincent Leva, the driver of the unfortunate car, was exonerated of any wrong-doing. I can see now why my grandfather never really spoke of his father or his death. It was a tragedy that he had to carry all his life.